Scotland's on Wednesday is a World Cup confidence boost for the players, says assistant coach Craig Wright. The 150-run victory in Abu Dhabi came after defeats in the one-day triangular series by and with a return against the Irish to come. "I think we're in a process of preparation," Wright told BBC Scotland. "It will give the guys a great deal of confidence but there are areas of our game we know we can do better with." The World Cup runs from 14 February to 29 March and Scotland, in Pool A, will meet Afghanistan again, plus joint hosts New Zealand and Australia, along with England, Bangladesh and Sri Lanka. The margin of the victory over Afghanistan means the Scots will be buoyed for the World Cup game against the same nation in Dunedin on 26 February. "It was a fantastic performance but we had to work really hard for the win in both innings," said Wright, assistant to head coach Grant Bradburn. "We lost a few wickets early before Richie Berrington and Josh Davey rebuilt the innings and gave us a total to defend and then Afghanistan came out swinging pretty hard with the bat. "But we managed to pick up a wicket and then we went through them to secure a dominant win. "Even though we won by 150 runs, there are areas of the game we can improve and we are capable of raising our game. "With our fielding we dropped a few catches and our top order batting hasn't quite fired the way we know it is capable of. "Yesterday was more like the batting performance we are looking for but we are always looking for more." 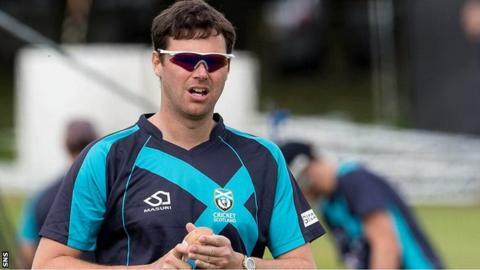 Scotland lost by eight wickets last Thursday against Afghanistan but might have been celebrating a brace of wins in the series had they held out against Ireland on Monday. Instead, they lost to the Irish by three wickets and will look for revenge in the return game in Dubai on 19 January. Wright added: "We don't have a particularly good record over the last few years against both these teams and we'd lost the first matches in this series against both. "I thought there were signs in the second match, against Ireland, that we were getting back to somewhere near the level we need to be at. Probably, in retrospect, we should have won that game if we had been a little bit more clinical. "Yesterday we were closer to the level again that we need to be at."